When a tunnel collapses on ordinary family man Jung-soo (Ha Jung-woo, THE HANDMAIDEN), his cell phone becomes his only link to the outside world. In the face of media frenzy and government officials jumping on a chance for good publicity, an emergency response team mobilizes to rescue Jung-soo with the nation s support. But as days go by and nerves stretch thin, Jung-soo must struggle for his life in the suffocating debris alone. Acclaimed director Kim Seong-hun (A HARD DAY) weaves another intricate thriller in this story of unthinkable disaster and one man s fight for survival in claustrophobic darkness. 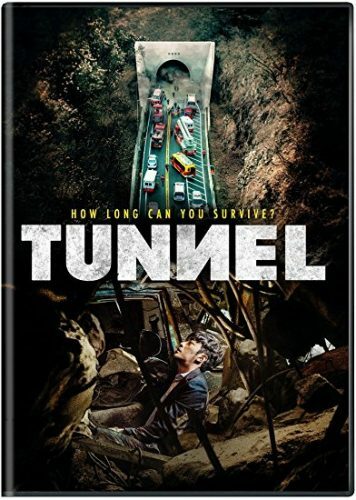 Tunnel is an on the edge of your seat thriller that doesn’t pack action but runs on Man-made Disaster A Car salesman for Kia is on his way home when he is trapped in his car by a collapsing tunnel he was driving through. The Story was a good watch and enjoyed it. I wouldn’t have been mad if we had another 30 minutes added on to tie in a few more things but the film does carry a 2 hour run time. The Disaster starts about 5 minutes into the film so the entire film deals with are trapped salesman and the effort of the rescuers on the outside trying to pull him out. Also some political views are placed here which I wanted to be more evil, like the corporation was found to have done shoddy work and made some shortcuts. We had some of that but I wanted to see it pushed a bit more so we can feel some more hate. The film also has some fun moments, sad moments and the moment the tunnel collapses an on the edge feel. The CGI is pretty realistic and I’m not even sure if the used it. It was real like, and was pretty scary when it was happening. Another portion of the film I wished was stretched out was near the end when the guy runs out of water and the film skips a few days ahead. I wanted to see how he survived. Also they should have made the guy more weak as time went on as he did not eat for 35 days. Overall the film was a great watch and It did have me on the edge for a bit of the film. Wished we would have got the Blu-Ray treatment for this title. Yes the film has some small fixes that need to be made like making are lead grow weaker as time went and an extended run time to fill in more story but mostly the film is worth the view. With that said I give Tunnel a 4 out of 5. Give it a shot, it will make your rethink before driving through another tunnel.